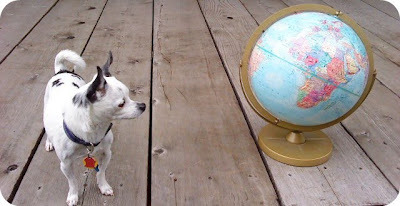 We happened to find this globe (for a steal) while walking Bono Baby this afternoon. Bono Baby was more than happy to model with it for us. He is such a super star. "Where are we at in the world?" Today I am doing my best to be in the present, right here in Washington State. Not in the past or the future in my thoughts. Happy as a peach with my boys. "Where are you at in the world?" I like this picture of Bono a lot! He looks very contemplative about his next journey here. love the picture. in the middle of spinning that globe. because it's so hard to be in the present, right here in alfred, new york!